One of my favorite interior designers out of St. Louis, Missouri is Amy Studebaker…I just love the way her designs exude a fresh yet timeless style with a unique collected vibe. This home in particular captured by photographer Alise O’Brien couldn’t be more stunning! 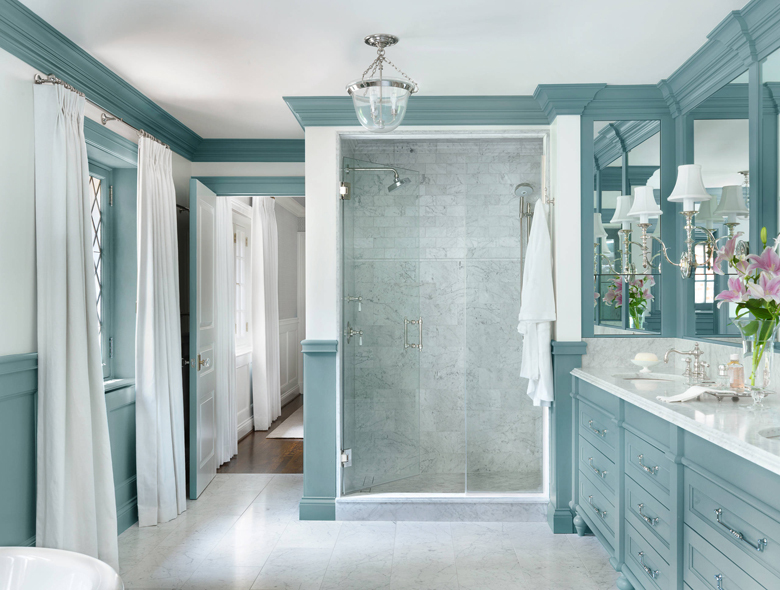 I mean, hello, look at this drop dead gorgeous master bathroom. 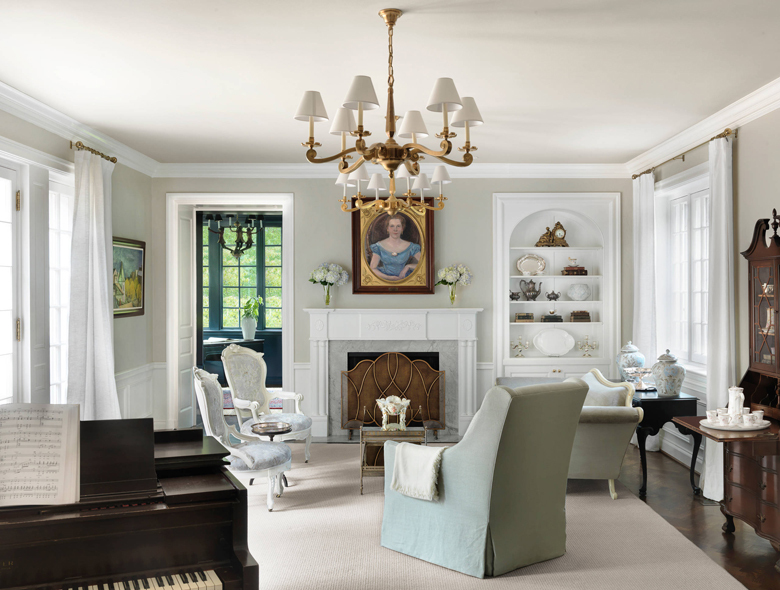 What a genius decision to paint the trim, millwork and cabinetry Farrow & Ball’s “Oval Room Blue”. The talented designer worked with PK Construction and Mitchell Wall Architecture and Design, who did a fantastic job designing the layout, on the award-winning master suite. The rest of the home shares the same fresh take on traditional–scroll on to see more of the beautiful home! I love how the colors flow into the master bedroom. The Schumacher wallpaper on the upper walls and ceiling is gorgeous! 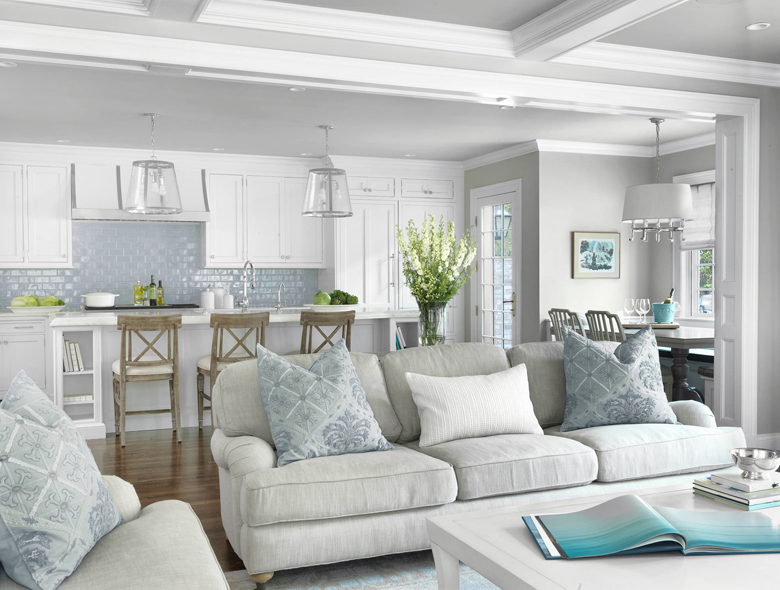 Serene colors fill the open and airy kitchen and family room, part of a new addition to the home. The light-filled study painted Benjamin Moore’s Hale Navy is such a stunner. The whimsical light fixture is original to the home…love it! 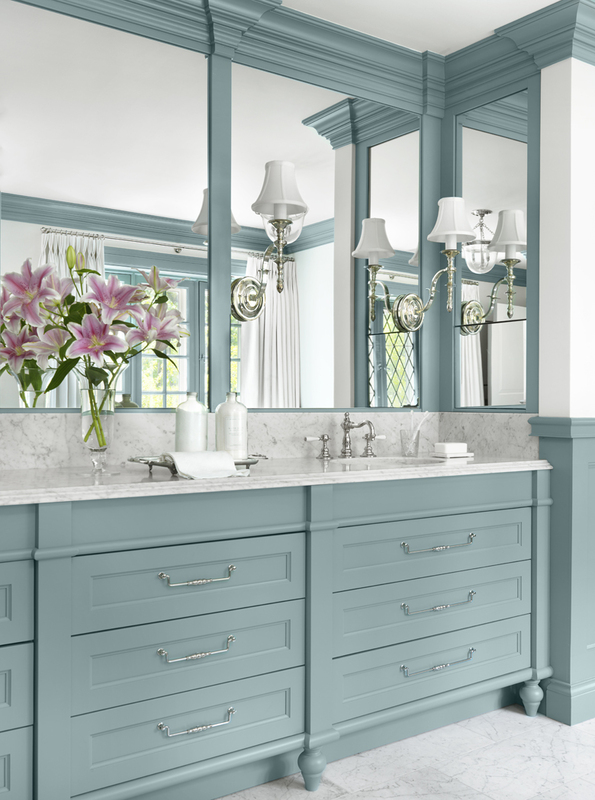 See more of the home, as well as other inspiring projects by Amy Studebaker Design here. And be sure to follow them on Instagram for even more eye candy and behind-the-scenes fun! This is just one of the most beautiful homes I’ve ever seen on here. I love the formality, the traditional tone, and the crispness of the whole thing. I love the pinch pleats. Move me in! (There’s probably an equally gorgeous guest room with en suite bath). Would you happen to know the paint color used in the family room – open concept – kitchen picture? I just love the gray color! You are so right! That master bathroom is really something special. Such a unique and beautiful take on traditional styling. Thanks for sharing! The house is luxurious. A great combination of white and turquoise! thanks for your article ! Would you share the color of the white trim? Thank you! Can you tell me the type/name of the bar stools at the island? Thank you.